Minutes of meeting for Friends of Dyke Road Park. The first meeting for Friends of Dyke Road Park was held on 16th November at Dyke Road Park Cafe. Jannet is a member of the Prestonville Community Associaton and she explained the kind of thing they do. Most members have been doing it five years or more. Would like more members. This group has has a bit of money – there is a pot – and they hold Charitable status. We agreed we would like to be affiliated under the Prestonville Community Association umbrella. * Mary and Dinah have agreed to be involved in this. Question – would it be ok for people outside of the Prestonville area to be involved in this? Martin to look at constitution. Fi – Action days, activities, litter, dog poo, park festival, lighting and security, planting and gardening?? Steve – Things could be done – would like to see shrubberies reduced down to increase safety/visibility. More open for security etc. Can’t do it on his own and needs a chipper. Money tight for everything. Has contact with Sarah ? nursery manager, garden designer for the Council. She is going to do a design for the rose garden. Effective designs in Valley and Steine Gardens. Fi – who’s willing to get on to the Council? * Derek – Willing to collate comments/issues that people want addressing. Happy to write a letter whilst he has the time. This may change if he gets busier with his work etc. Try to find out who is responsible for different aspects of the Park. * Dinah – Willing to put together the Constitution, liaison people etc. George – Will help with lists of people – to make as many contacts at the Council as possible and try and find out about a Park Ranger who could co-ordinate days of action etc. Janet – We should talk to Friends of Withdean Park. They meet once a month on a Sunday. If we wanted to do this maybe Steve could leave instructions for us if he’s not working. Is there an information pack? Would be great to get hold of something like this. They have a Ranger who co-ordinates their Action days and is present. Steve – Geoffrey Theobald, Counsellor wants the park to be green-flagged. Find out more about this? Derek – Has spoken to a Police Community Support Officer – he will try to get in contact with them so that we can invite a PCOS to a meeting at some point. Steve – Could use tennis courts to provide stuff for teenagers – multi use for basketball etc. Martin – pointed out that the Church Hall in Exeter St runs a once a fortnight youth club, Fridays. Alison – Green Gyms – Idea of physical fitness and doing work that’s needed around park, weekly meetings. Links with Health Centres, GPs etc. Volunteers to help with this – Alison, Rita and Mary. Idea of community allottment. Steve – could put it between the hedge and the tennis courts. Suggested we speak to local schools, organisations – letters. Invite someone from each of the following to come along to a meeting. Linda – Windlesham, Cottismore and Cardinal Newman, Fi – Mosque, Martin – BHASVIC and Stanford Schools, Bowling Green Reps – could Steve speak to them? ???? someone agreed to talk to Tesco to see if they would be interested in sponsoring something like interactive bins! Chris said she would speak to the local shops to see if they would be supportive. Martin – Some Brighton Parks are protected from cuts. Why are we not? Steve – Improvements were put in place before cuts so hopefully the money is safe. Ideas – Sculptures/Art in the Park? maybe BHASVIC? Close the gap between the fields? Could there be a path through as a compromise? Rubbish/dog poo etc. currently a cause for concern. More bins. Chris – idea of competition getting kids to design bins/recycling bins. Sponsors – Maybe get Tesco involved. Talk to chip shop. Steve – TA would like some input into organising/helping around park. He will speak to them and we can invite someone to a meeting. Derek and Ian – have offered to build a website. Suggested we look at the PCA site – they use wordblog. Fi mentioned the St Ann’s website. Publicity – 7 Dials Directory. Feature Argus (Nikki)? Mary – Bird watching, feeding the birds etc. Lots of people have ideas about this. Mary will speak to Booth Museum to see if they have any ideas for a project in the park. Bird boxes? Listing birds on the website, sightings of rare birds, what birds are already in our park. Next meeting, Tuesday 14th December 2010, 6.30pm. Bring your own Mince pies, wine etc. Vahid happy for us to use the cafe unless it has been hired. Steve to ask if we can use bowling club hut in this instance. 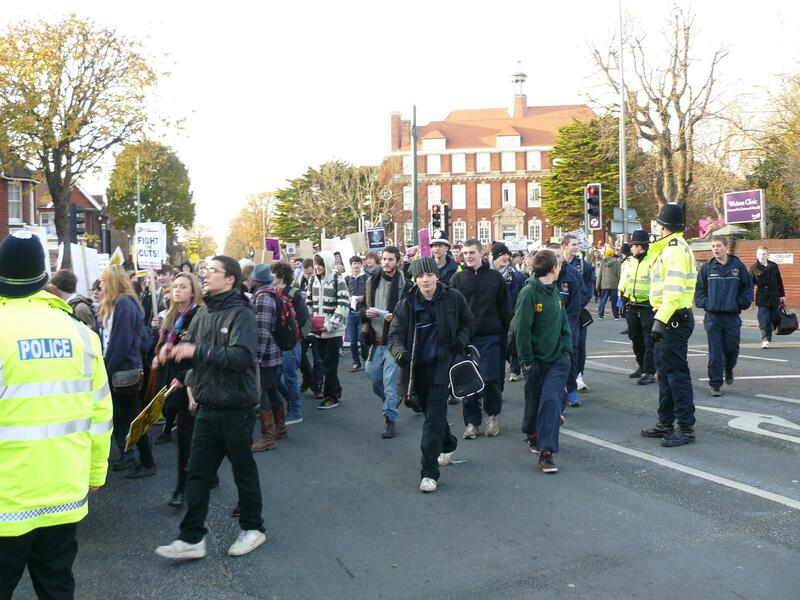 Dyke Road Park was the gathering-point for students taking part in the day of action against education cuts and tuition fee rises on 24 November. Police estimated that about 2500 people took part in the march which set off from the park. Many were pupils from schools in Brighton, Hove and Lewes. Square Bay, who now own the big empty plot next door to Brighton Station, have unveiled plans to fill it with offices, flats and a 98-room hotel. 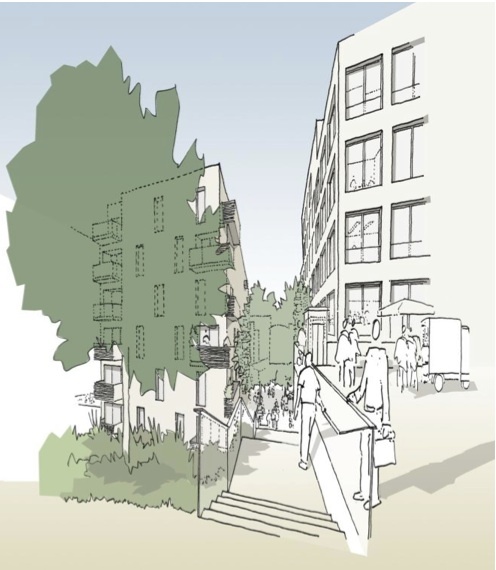 They are holding a public consultation down the road at the One Brighton development on Thursday, Friday and Saturday. The scheme sounds pretty low-key – the opposite of the 42-storey tower proposed by the previous owners, Beethams, which was seen off by local protests, the Council and a public inquiry.